Hi and welcome to Catherine’s May release “Wild and Wonderful” and our Day 2 blog hop. Did you arrive from Kelly’s blog? Then you’re at the right place. If not, you can start at the beginning. What do you think about mixed media cards like that? Are mine good examples for the May release? 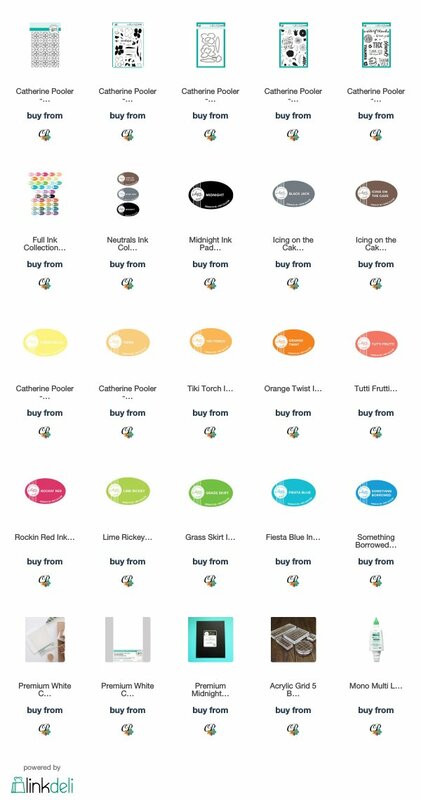 Don’t forget to leave a comment on every stop of the hop for your chance to win 2 ink pads of your choice. Catherine will draw 5 winners on Friday, May 25th. cardmaking, Catherine Pooler, embossing, water color. Bookmark. Here you are, totally killing it with the mixed media techniques! I love all your cards! Thank you for sharing your creation. I love how you used just a piece of the background stamp in spots to add texture. I hadn’t thought to do this and am excited to try it when my order arrives with the latest CP items. Oh my! I am just loving all the color here. And the stems for the flowers are so creative. Beautiful card designs. Love the flowers with the black and white stems. The backgrounds turned out beautifully. Absolutely fabulous and I love the backgrounds. In LOVE with your mixed media cards. Crazy over the flower stems. Looks like a painting that needs to hang in a gallery! Absolutely LOVE that bite of thanks card. So gorgeous. Gorgeous cards! Love the vibrancy of the colors & mixed media style! I love the vibrancy of the cards! I love both cards. The backgrounds are beautiful and the flowers so colorful! Can you tell me the brand name of the tiny die cutting maching you used and where you got it? I would love to have one to go with this Wild and Wonderful set. Love your cards. The quircky flower stems are adorable. Love how you did these cards, Josefine. Thanks for sharing. These are beautiful!! I just love the smooshing technique!! I’ve never tried it but think I will now!! I’ve always been more of as Spa Collection gal, but your backgrounds are making me think I need to have all CP’s inks. Beautiful cards! Thanks for sharing your technique for drawing the stems. I’m going to try that out! I love the colors you used for the flowers and the blending background. Wow those are wonderful. I love the backgrounds. So creative! I love your cards and felt like a got some great tips! Even just picking up the background so you get those great touches of stamping!. I also loved the stems of the flowers, great idea! Thanks for sharing your creativity and talent with us! Wow great cards! I absolutely loved watching your video! I learned soo many new techniques watching it! Thank you so much for that! Awww!!! Both these cards are simply amazing! Beautiful combo of colors!!! Goodness me your cards are so vibrant. love them. These cards are just amazing. Beautiful cards. When I get home I will play with your ideas. Love your video and your cards! Great video. I love how CP inks ink smooch as well. Your cards turned out fabulous. Love how you added the zebra stems. i absolutely loved your cards. They have been my favorite so far. Like how you use background stamp to add just another dimension. Love your backgrounds and the flowers! It’s so much fun to make your own backgrounds and to see what you create each time! Love the tip of just using part of a background stamp for dimension. Gorgeous cards! Fantastically vibrant and whimsical. Fabulous! Cute cards. Love the cheery and bright colors. Beautiful cards. I love that first card! The colours are beautiful. TFS!! Beautiful cards! So vibrant and colorful. Beautiful card designs. I love that first card! i LOVE THE STEMS – SO ORIGINAL! I’m totally digging these cards! Fabulous colors! Love the whimsical feel of them. Thanks for time you put into narrating your creations! Your cards are stunning! Beautiful backgrounds …so vibrant. Love your cards! My favorite! Such beautiful cards – love the flowers and the backgrounds. Your backgrounds are gorgeous and I love your mixed media style! Wonderful backgrounds and the flowers are lovely. Wow !! You’ve made such a fantastic job with these cards!! The bright colors are stunning ! WOW!! Your mixed media techniques never cease to amaze me, Josefine. Stunning!! I really liked your red/yellow card – that is totally my style! I will be copying this when I get my goodies in the mail! Oh my–those are so gorgeous. Love the vibrancy of the colors and never thought of using the background stamp like that–love it! Beautiful background colors, gorgeous cards and enjoyed the video also. Thank you for sharing. These. Are. AWESOME!! Love how you used the Kaleidoscope stamp. Great cards Josefine. Beautiful backgrounds and they are a good showing of the new products! Thanks for sharing with us!! Your cards are so colorful. I love the background. Your backgrounds are gorgeous! I can’t wait to try them! Thanks for sharing this technique!